Official Jeweler of the WBS "World Tour"
Every Major East Coast and Florida Boat Show! The "Macho Man's" 14K gold anchor bar-link jewelry necklace and bracelet are very solid, thick and heavy ! A statement piece! Each link IS OVER, 9/16 INCH in length and 3/8 INCH WIDE! FOR A SLIGHTLY SMALLER LINK, SEE OUR STOCK NUMBER 14-15 WITH EACH LINK MEASURING 7/16 INCH IN LENGTH! 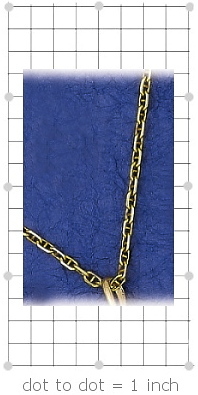 One of our most popular solid 14K gold bar-link jewelry chains! 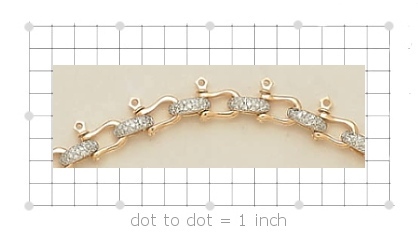 Each link is 7/16 inch IN LENGTH AND ALMOST 5/16 INCHES WIDE! . Making it very satisfying as a bracelet or necklace! FOR A LARGER LINK, WE OFFER STOCK NUMBER 14-17 WITH EACH LINK MEASURING 9/16"! 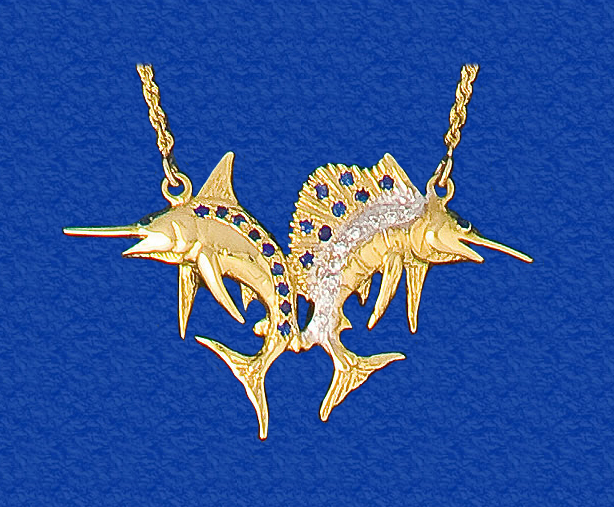 Marlin/Sailfish "duo" in diamond pave pendants with saphire accents... and for the "perfect" finnishing touch.... A necklace of 14K gold fishing swivel chain that actually swivel! This one will "catch" every eye! Nautical jewelry at it's BEST! 0.72 ct Diamond and 0.69 ct Sapphires T.W. SW-300. Got your name in the record books OR WANT IT THERE? 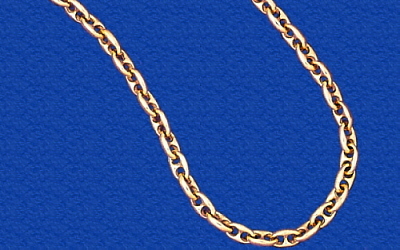 The Swivel 300 is the ultimate Solid 14K Gold fishing swivel jewelry chain there is! Go for it! Every swivel actually swivels like silk! We are the originators of this chain and we know how to make it right. IN FACT, WE GUARANTEE OUR SWIVELS AGAINST MANUFACTURING DEFECT FOR TEN YEARS!! All our Swivel 300 Chains come to you with our GIBRALTAR CLASP…THE TOUGHEST, MOST RUGGED, INDESTRUCTIBLE SOLID 14K GOLD CLASP THERE IS!! In fact, we make it with a STAINLESS STEEL SPRING to resist salt water corrosion and a thick solid 14K gold claw you will never bend straight! Our swivels are sized according to the actual swivel sizes as found in any Tackle Shop. Others may offer size designations such as medium, large and extra-large, all if which are meaningless. Available in ALL Bracelet and Necklace Lengths! Pricing Examples...: 4,286.00 for a 9 1/2 inch bracelet and 11,345.00 for a 24 inch necklace. CALL TODAY AND LET’S TALK IT OVER! One pair of kissing turtles pendant on a 14K gold 2.5mm rope chain necklace INCLUDED. A charmer! 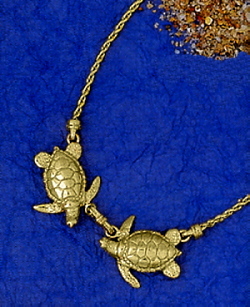 Sea turtle jewelry in 14K gold. Solid 14K gold! Working snap shackle clasp with genuine sapphire in the pull pin. Perfect men and women's bracelet or necklace nautical chain jewelry. 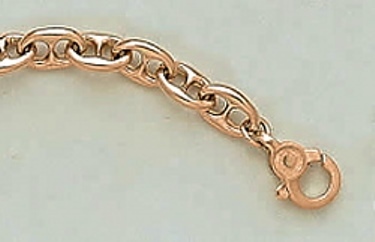 Solid 14K gold anchor bar-link motif as a jewelry chain! Each link is 5/8". Boating jewelry bracelets and necklaces! 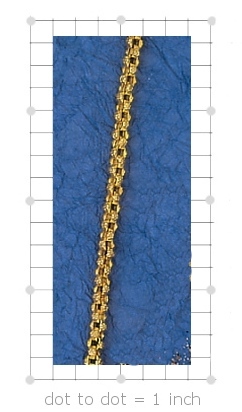 Solid 14K gold anchor bar-link motif as a jewelry chain! Each link is 1/2". Boating jewelry bracelets and necklaces! 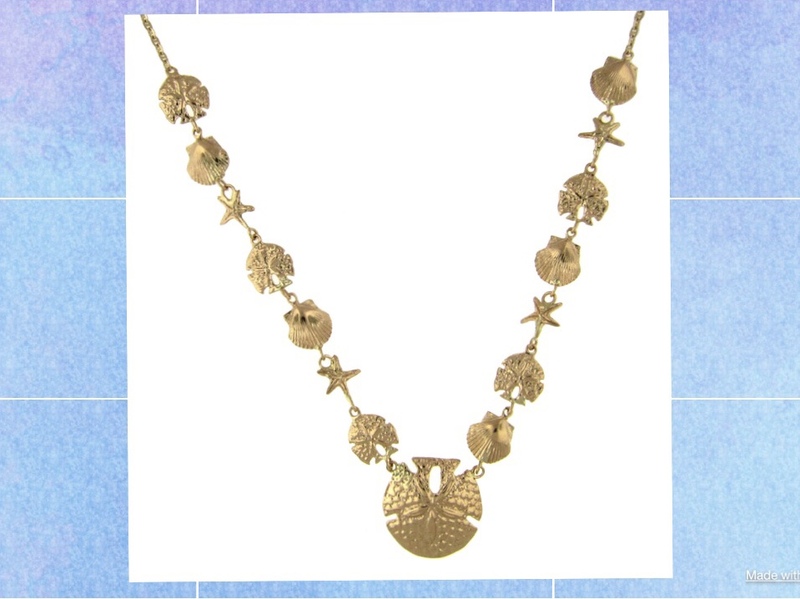 Every other Starfish is in resplendant contrast to it's neighbor in this lovely 14K gold necklace! 2/3 ct. Genuine Diamonds T.W. 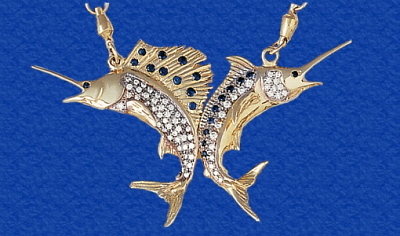 Marlin and Sailfish as solid 14K gold fishing jewelry pendant with .09 ct. Diamonds and .25 ct. Sapphires. Solid 14K rope chain 18" in length IS INCLUDED in this necklace at no extra charge!!! Solid 14K gold beach shells, center sand dollar all put together on a 14K gold rope chain! Perfect every day necklace. 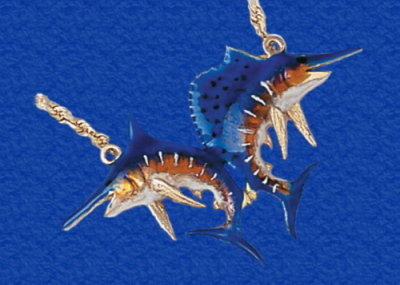 Marlin and Sailfish as solid 14K gold fishing jewelry pendant with hand applied enamel. 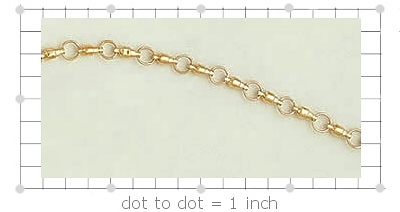 Solid 14K rope chain 18" in length IS INCLUDED in this necklace at no extra charge!!! 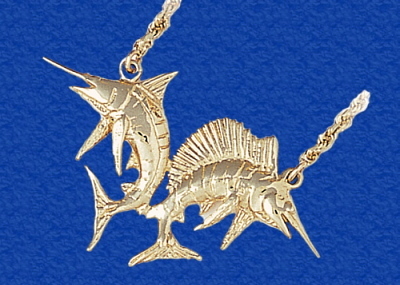 Marlin and Sailfish as solid 14K gold fishing jewelry pendant with solid 14K rope chain 18" in length IS INCLUDED in this necklace at no extra charge!!! Prices and stock numbers are subject to change or correction at any time. © 2016 Nautical Jewelry Originals. All Rights Reserved.